Glenn Anderson played in a "MegaStars Game" during the Heritage Classic, which consisted of two 15-minute periods. The National Hockey League is going back to its roots, in a sense, on New Year's Day, when the Buffalo Sabres host the Pittsburgh Penguins at Ralph Wilson Stadium in Orchard Park, N.Y.
Ralph Wilson Stadium is a football field that is better known for being the home of the National Football League's Buffalo Bills, but the boards will be up, the ice will be down and hockey will be played in its natural setting – outdoors, in cold weather. Until the last generation of hockey players, that is where kids learned to play the game – outdoors, and in cold weather on a frozen lake, river, stream or pond. Now, kids learn to play in climate-controlled rinks in cold-weather spots, as well as warm-weather areas. But there is something to be said about being outdoors in the cold weather on a pond, according to Glenn Anderson, a 498-goal scorer with the Edmonton Oilers, Toronto Maple Leafs, New York Rangers and St. Louis Blues. Anderson also is a member of five Stanley Cup Championship teams, four with Edmonton and one with the Rangers. 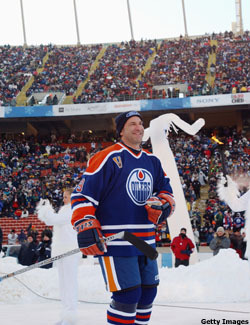 Anderson was on the ice the last time the NHL staged an outdoor game, on Nov. 22, 2003 at Commonwealth Stadium in Edmonton as part of the Heritage Classic, playing in an old-timers’ game between alumni from the Oilers and the Montreal Canadiens. Later that day, the present version of those teams played a regular-season game outdoors, the first such game in NHL history. Some of the greatest players in the history of hockey were on ice that afternoon. Hall of Famers like Wayne Gretzky, Mark Messier (who still was playing as a member of the New York Rangers), Grant Fuhr, Paul Coffey and Jari Kurri put on the Oilers jersey one more time. Guy Lafleur and Larry Robinson highlighted the All-Star contingent for the Canadiens. Anderson still remembers his time that day vividly. He remembers that it was cold – extremely cold – and he only was on ice for a preliminary exhibition contest called the "MegaStars Game" that consisted of two 15-minute periods. he temperature was about zero degrees Fahrenheit, and there was a stiff wind to make it feel even colder. In other words, it was Alberta hockey weather at its best. "That particular day there was a little chilly, but we had good underwear that we borrowed from the Edmonton Eskimos football team from the CFL and we had toques on and we had blowers on the bench," Anderson said. "The only thing I found difficult was the ice ... it got so cold that the ice was really chippy and it was really difficult, you were like skating on a lake that hadn't been Zamboni-ed in three weeks." Anderson and the other players in the game that day were tasked with shoveling the ice between halves. For time immortal, kids have performed that same chore on frozen rivers, streams, lakes and ponds so the ice is a bit better and more playable. The Heritage Classic came about because Oilers management wanted to celebrate the franchise's 25th anniversary season in the NHL. The Heritage Classic was the first regular-season game to be played outdoors in the modern history of the NHL. The New York Rangers and the Los Angeles Kings played a pre-season contest in the parking lot of Caesar’s Palace in Las Vegas in September 1991. They borrowed a concept that had worked well two years earlier. On Oct. 6, 2001, Michigan State University and the University of Michigan provided the Oilers and the NHL with the blueprint for an outdoor game when the college rivals played at Michigan State's Spartan Stadium, home of the school’s football team. Michigan State installed a rink in the middle of the stadium and drew more than 74,000 people to see the game, which ended in a 3-3 tie. The Heritage Classic borrowed its concept from the Michigan State versus the University of Michigan game that was held outdoors on Oct. 6, 2001. The frozen tundra of Green Bay's Lambeau Field was turned into an ice rink in February 2006 when Wisconsin hosted Ohio State in a college hockey game which drew more than 40,000. Swiss hockey officials decided to go "outdoors" nearly a year ago, when SC Bern and SC Langnau played their 100th game against one another at Bern's Stade de Suisse, Wankdorf before a crowd of 30,076 on Jan. 14, 2007. There was some discussion that the Rangers and Islanders might play at Yankee Stadium in the Bronx, N.Y., but that plan has never gotten beyond the talking stage. The Boston Red Sox ownership group always is looking to maximize the use of Fenway Park, and the old ballyard eventually may host a college hockey game. Going outdoors is becoming trendy. At the Heritage Classic, first the Oilers alums beat the Canadiens alums 2-0 on goals by Ken Linseman and Marty McSorley. The Canadiens goaltenders, Steve Penney and Richard Sevigny, played well, as did Oilers netminder Grant Fuhr. But it was the other goaltender, Bill Ranford, who dazzled that afternoon, stopping 14 shots. "Both (Edmonton) goalies played extremely well," said Anderson of Fuhr and Ranford. "As always, in those big, clutch games, your goalies have to come through for you and they did that night." The 2003 Oilers and Canadiens took the ice about one hour after the MegaStars and played a tight contest that was decided at 14:16 of the third period on a Richard Zednik goal, which gave Montreal a 4-2 lead. Steve Staios scored 39 seconds later to cut the deficit to one, but Jose Theodore, who played with a toque over his goal mask and helmet, shut down the Oilers the rest of the way, and Montreal skated off with a 4-3 win. But playing before more than 57,000 people in a football stadium is not like skating at a local pond; in that sense, Anderson was not taken back to his days as a kid. "No, not that day. It was more of a media frenzy that day," he said. "We didn't have time to talk to the guy who was sitting beside you in the dressing room. So it was more of a big promotion with what was going on with the media and how the Oilers brought it up with Montreal." These days, Anderson still gets to play the game the way the originators of hockey intended it to be. He skates in a friend's backyard at a homemade, old-fashioned rink, just like he did growing up in British Columbia. "We still do it today. We got a friend of mine who has a rink in his backyard up here in Stamford (Conn.) now," Anderson said. "It's like a different era and reminds me of going to the rink early in the morning and having the whole rink to yourself anytime you want, that's special to me when I go up to skate at this person's rink in his backyard." It is a good bet that Buffalo on New Year's Day will not be as cold as Edmonton was in November 2003, but it does snow a lot in Buffalo and lake-effect snow could be a problem. But young river-hockey players know how to deal with the elements. They bring a shovel and dig out the ice and then play. 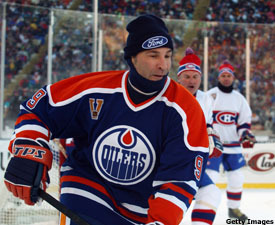 Hockey really is meant to be played outdoors on cold days with winter elements, as Glenn Anderson gladly will tell you.